Clients at Ultima Beauty Boutique in Trafalgar can enjoy a delicious cappuccino and watch their children play while they have their makeup, hair removal, pedicure or nail enhancement procedure. This special attention, as well as quality service, has helped founder Joanne Woolard quickly establish herself as a popular local business. Thanks to the Small Business Mentoring Service, her clinic, which opened in December, 2010, is off to a flying start. Ultima Beauty Boutique’s motto is “nothing is too much trouble”. As well as catering for all their beauty needs, Joanne and her staff take time to inform their clients about correct maintenance and care of their skin and nails as well as how to apply makeup. 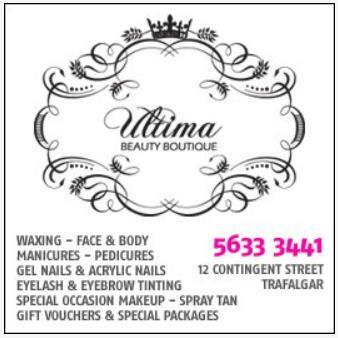 Ultima Beauty Boutique offers a range of services, including hair removal for men and women, eyebrow and eyelash tinting, special occasion makeup, pedicures, nail enhancement and spray tanning. A growing number of men are using the service. The clinic also stocks the well priced professional cosmetic range Bodyography. Joanne was experienced in the beauty industry but had not run her own shop when she met mentor Leo Billington through the SBMS Bushfire Recovery Program. Leo has extensive experience in local and regional business development across Gippsland and more recently with the Latrobe City Council. Since 1990, he has focussed on helping small to medium enterprises with business planning, action plans, marketing plans and written material including press releases. Joanne and Leo had 11 sessions over a year under SBMS Bushfire Relief Program. They plan to stay in contact as the business progresses. Marketing and the importance of a website. Joanne says thanks to Leo’s help and small business knowledge, it took just two weeks to open the shop once they found it. The premises had been used by a physiotherapy practice, which was a bonus as it was already reasonably well set up. Leo’s advice was invaluable. For example, ensuring Joanne researched council regulations before fitting out the shop helped avoid potentially costly adjustments. Leo also helped source a wax bed, which had been proving difficult. Partly due to Leo’s help, Joanne says since she opened the number of customers has increased by 50 per cent, enquiries by 50 per cent, profits by 20 per cent and sales by 10 per cent. 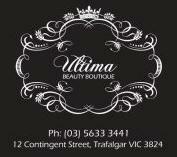 Ultima Beauty Boutique has its own Facebook page and Joanne is working on a website. She now has three employees and two manicure tables. The employees are trainee Emilee Ruddell, Barb Mickan from Daydreams of Warragul and part-timer Roslyn Shields, also formerly of Warragul. Barb and Roslyn are both experienced in the industry. Leo says that Joanne now understands succession planning and the regulatory side of establishing a new business, particularly local government regulations. She also has improved financial planning skills and is aware of the need for on-going business planning. “Joanne’s self confidence has also been increased,” Leo says.